In a city full of great wedding venues, the National Gallery of Art truly stands out from the crowd. In the opinion of these DC wedding photographers, it is one of the best places for couples portraits in Washington. The diversity of settings and backdrops within the museum’s two buildings is unparalleled. A Washington, DC, wedding photographer can unleash their full creativity and get truly spectacular pictures of brides and grooms. The National Gallery of Art has been a Washington fixture since 1937, when it was created by a Congressional joint resolution. It houses a collection of works that charts the evolution of Western art from medieval times to the current day. Significant portions of the collection and funding came from philanthropist Andrew W. Mellon. Since its creation, the institution has grown to become one of the largest museums in the country. The National Gallery of Art is also hands down the most popular art museum in DC. More than four million visitors pass through its halls annually. As a point of comparison, the second-most popular attracts less than 2.5 million per year. Though it is surrounded by museums that belong to the Smithsonian Institution, it is not actually a part of the latter. The museum is divided into three different sections: the West Building, East Building and Sculpture Garden. The West and East Buildings are connected by an underground passage called “The Concourse.” The Sculpture Garden sits on the other side of the West Building, next to the Smithsonian National Museum of Natural History. The West Building is the oldest of the three parts of the National Gallery of Art. Its architect, John Russell Pope, also designed the Jefferson Memorial. Unsurprisingly, both share a similar neoclassical style. Built from pink Tennessee marble, the West Building is shaped like a giant H. In its center is a domed rotunda meant to evoke memories of the Roman Pantheon. This part of the National Gallery of Art houses the older portions of the museum’s collection. It has European paintings and sculptures from the Middle Ages through the late 1800s. It also contains artwork done by Americans before the 1900s. The centerpiece of the West Building is the only Leonardo da Vinci in the Western Hemisphere. The design of the East Building is strikingly different. Renowned architect I.M. Pei designed it based on triangular motifs. Viewed from above, the edifice appears to be shaped like a trapezoid. Closer inspection, however, reveals that it actually comprises two triangles set together. The highlight of the East Building is an enormous atrium constructed from the same Tennessee marble as the West Building. The East Building’s collection focuses on modern and contemporary art. The most notable installation is the largest mobile that Alexander Calder ever produced. The subterranean walkway that connects the East and West Buildings under 4th Street contains one of the museum’s most visually striking works. American artist Leo Villarreal created a futuristic metal tunnel illuminated by 41,000 LED lights that blink in hypnotic patterns. “Multiverse” is a dazzling work of art and a great place for couples portraits. The unique setting is a favorite of almost every Washington, DC, wedding photographer. The Sculpture Garden is the newest of the National Gallery of Art’s three parts. It was designed by Laurie Olin, completed in 1999 and intended to be be an outdoor space for art installations. It contains sculptures by renowned artists like Marc Chagall and Roy Lichtenstein. In the summer, the Sculpture Garden also serves as a 6.1-acre park where visitors to DC sit and enjoy the sun. In winters, the circular fountain in the center of the garden freezes over, turning it into a popular skating rink. 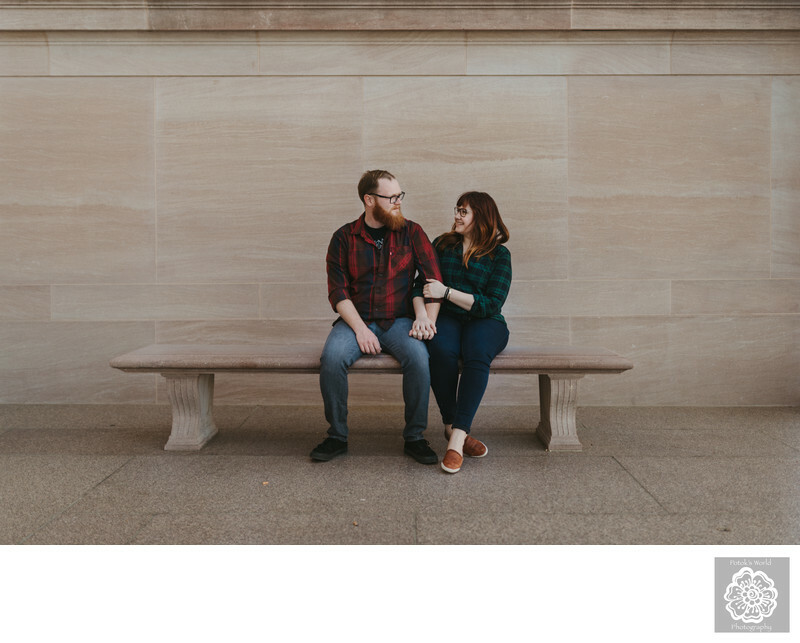 Thanks to its numerous trees and flowers, the Sculpture Garden is an extremely desirable location for couples portraits. Many DC wedding photographers like us bring fiancés and newlyweds there for beautiful portraiture. Despite the National Gallery of Art’s striking installations and iconic architecture, we went with a simpler backdrop for this image. We wanted to highlight just the couple and their lovely body language. We loved the way they interacted and how they made each other laugh. So instead of posing them in front of something spectacular, we put them on a bench between the East and West Buildings. With nothing but a blank marble wall behind them, the fiancés are the only focus of the photograph. The viewer’s eye is drawn immediately to them. Location: National Gallery of Art, 6th & Constitution Ave NW, Washington, DC 20565. Keywords: National Portrait Gallery DC (3), National Portrait Gallery Engagement Session (3).